As time went on for the Roseland Heights ward remap forum it became more and more packed. Michael LaFargue of West Chesterfield and state representative and ward committeeman candidate Richard Wooten were in attendance. Also petitions and form letters were passed around regarding the ward remap. The highlight of the evening was a presentation and discussion by Jean-Paul Thomas who gave a lot of necessary information in how to conduct this remap fight. His unfortunate conclusion to those opposed to the remap is that the neighborhoods of the 6th Ward south of 87th Street will be drawn into the 9th Ward. Basically most of the information is a rehash of what had already been stated in the media or at other ward remap hearings. Communities of interest, 2010 census numbers, legal standing, etc. I won't bore you by rehashing those facts. We already know people are groaning about about the 2010 census count, but there isn't much to be done about it now. There are those who simply refuse to fill out the forms and then complain later when the consequences don't go there way! We're living in that reality now. Although I didn't know before this meeting that there was not only an undercount in Black communities, but also in Latino communities as well. I also didn't know that in doing a headcount of all peoples living in this nation one need not be a US Citizen to be counted. That fact could be one explanation for any recount in Latino communities and the City Council Latino caucus are seeking more seats on the city council because they actually did add people within the last 10 years. All the same while many in attendance may not have liked Mr. Thomas' conclusion he noted many things about this process. To start the communities of West Chesterfield, Chesterfield, and Roseland Heights vote. It was noted by Ald. Sawyer as well and perhaps 9th Ward Ald. Anthony Beale recognized that enough to start reaching out at least to Roseland Height's President Clevan Tucker. The potential for being power brokers for the 9th Ward was mentioned especially if those communities got together with those communities who aren't fans of Ald. Beale. Thomas specifically said it would not serve anyone very well if they didn't recognize the history of a community especially political history. Another possibility is to possibly reduce the number of Chicago wards. I'm sure that is very unlikely to happen but a possible result of this would be that the three communities affected by this remap might be able to remain in a ward under Ald. Sawyer. Even if a map that draws the southern end of the 6th Ward into the 9th were to pass another possibility is a legal challenge. While I hope that won't be necessary it might be a very strong possibility to keep the 6th Ward as close to intact as possible. The only thing not clear is on what grounds could any potential map agreed upon could be challenged in the courts. The good thing is that the affected neighborhoods are making noise in making their wishes known. 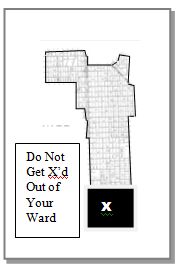 Note there are other communities fighting for their wards such as the 19th Ward which could change to accommodate the population loss in the nearby 21st & 34th Wards. Finally in continuing to make noise about this remap it was encouraged that residents continue to get in touch with 21st Ward Ald. Brookins (chairman of the city council Black Caucus - contact info here) and 33rd Ward Ald. Richard Mell (chairman of the city council Rules Committee - contact info here) to let them know their thoughts about the remap. Also I want to note that the last scheduled Rules Committee remap hearing is on Thursday, November 17th from 10 AM to 1 PM located at City Hall @ 121 N LaSalle Street in the city council chambers! And let's not forget that the December 1st deadline for the city council to approve a map is just around the corner!